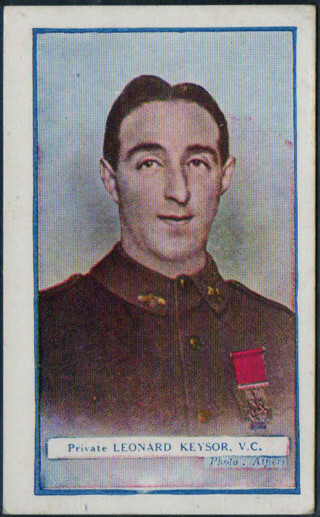 Leonard Keysor from Paddington was part of the ANZAC forces at Gallipoli. Leonard Keysor, born 3rd November 1885 at 14 Lanhill Road, Paddington, is considered by many to have carried out some of the most spectacular individual feats of the war, earning him the Victoria Cross, the highest award for gallantry that a British and Commonwealth serviceman can achieve. When the First World War broke out, Keysor was living in Sydney – where he’d emigrated a few months earlier – and he enlisted in the First Australian Imperial Force. Two months later Keysor sailed to Egypt and on 25 April 1915 he landed at Gallipoli to take part in a major expedition to take the Gallipoli Peninsula. It was at the Battle of Lone Pine on 7th August 1915 that 29-year-old Keysor performed the act of bravery for which he would be awarded the Victoria Cross. By this time Keysor had become a master bomb thrower. Turkish bombs were round like cricket balls and made of cast iron with an external fuse. Keysor would smother bombs that landed in the trenches with sandbags or clothing. If he had time, he would throw the bombs back – on several occasions he even caught them midflight – before lobbing them back into the Turkish trenches. He was twice wounded but refused medical aid, maintaining his efforts for 50 hours and saving the trench. Keysor had always considered himself a Londoner and he returned to England after the war to live out his life in and around Maida Vale and Paddington. Westminster Council will unveil a memorial paving stone outside his Paddington birthplace in 2015 to commemorate the Victoria Cross Leonard won at Gallipoli a century ago. Thank you for letting us know Chris. I’m pretty sure that the photograph of ‘Leonard Keysor’ on this page is actually a photo of the wartime Prime Minister of Australia, William Morris (Billy) Hughes….or a true lookalike!